The bracing campaign for independence gave Scots a vision of a real political alternative. Yesterday, the long deliberation of the Scottish people over self-rule went down to the wire. This morning, the United Kingdom is still alive, though it has lost a lot of blood and guts, and may never recover. The outcomes of national referendums are notoriously difficult to predict, let alone control. That is why gatekeepers of the status quo fear them. Numerically, every vote counts, so the democracy involved is pretty direct. More important, people begin to believe that their vote, for once, is actually going to count for something. That’s a rare experience, especially for those who have concluded that representative democracy, in the neoliberal era, is a rotten end-game. Even if they were not cheering him on, the pro-unionists could hardly take issue with SNP leader Alex Salmond’s description of the ceaseless debate, in every corner of the land, as a “festival of democracy.” Who would not marvel at the civic fervor that washed over the Scots in the lead-up to the referendum? Especially when the reward was the chance to make history under conditions (contra Marx?) of their own choosing? A radical act of secession, finally, without the clash of arms. Except that the conditions were not freely chosen. David Cameron’s insistence that Scots be denied the “devo-max” ballot option to transfer more power from Westminster left voters with a stark choice. All the evidence suggests they would have gone for that option, and that Salmond himself would have been happier not to push for independence quite so soon after his party took power. In the last few weeks, when the polls showed the race was tightening, the Tories were forced to turn off their fear machine—a Yes vote will crater your economy!—and resort to payoffs instead. And when working class voters in the old industrial belt showed signs of straying too far from their Labourite loyalties, Alistair Darling and Gordon Brown, Labour’s Scottish kingpins, urged their party (founded by a radical Scot, Keir Hardie, who advocated home rule) to go along with the bribery. The gravy offered up in a scramble just two days before the vote–and pledged by all three major parties—was more or less what would have gone into the devo-max option. So how canny were the Scots? Hadn’t they gotten what they wanted in the end, one way or another? More say-so over their affairs, including enlarged taxing powers to fund the country’s generous social provisions, authority over healthcare spending, and a stronger buffer zone to ward off Westminster’s death-eater austerity policies? Even if this had been a covert strategy all along, not too many Yes campaigners will be touting it in the weeks ahead. For one thing, it depends on the government keeping its promises about further devolution. That outcome is by no means assured. The coalition’s Euroskeptic backbenchers will not be happy about any plan to further erode Westminster’s sovereignty. In addition, making good on the pledge may be complicated by the newfound appetite for legislative initiatives to explore regional devolution in England itself. But the more pressing reason for reticence on the part of independistas has to do with what happened during the months when the campaign really took off. Because the devo-max option was officially off the table, the citizenry were forced to take a much closer look at independence, and many realized the prospect was much more appealing than they had imagined. For starters, there would be liberation from the corrupt, hereditary elite that still runs the British state, deliverance from gung-ho militarism, safe haven from the predatory reach of the financial centers, and the chance to put a stop to pell-mell privatization. On the constructive side, there would be the virgin pleasure of inventing a new kind of state— tempting evidence, for some, that another world was possible. 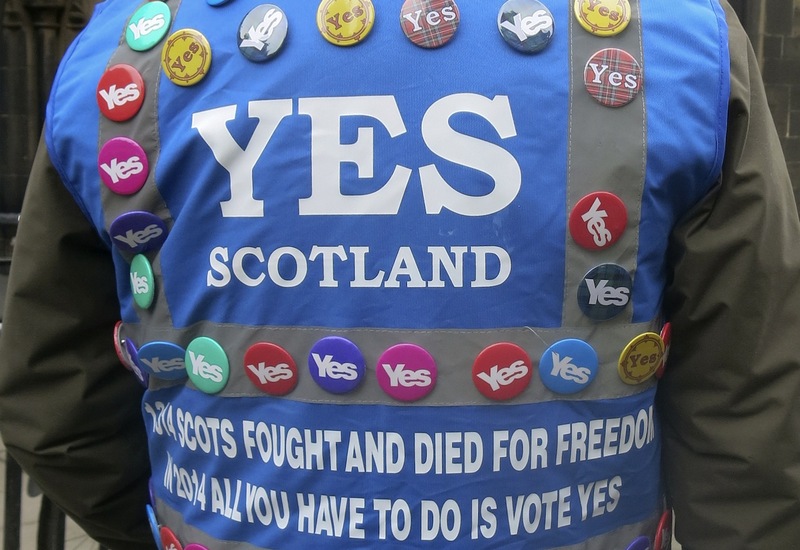 With the wind at its back, the Yes campaign sloughed off any lingering reliance on the romance of ethnic nationalism, and grew some strong grassroots among populations who had not been politically engaged in decades. The massive turnout for yesterday’s vote (more than 90 percent in some constituencies) was a tribute to the deep popular sentiment stirred by the vision of a real political alternative. After firing up the hopes of real empowerment on the part of the most deprived segments of the electorate, it would be bad faith to claim that the campaign was always counting on Plan B in the form of devo-max. Even so, dismay at the final result will be tempered now by the conviction that constitutional changes are on their way, on both sides of the border. They will not be as clearcut as the separatists wanted, but, in the long term, they may well hasten on the break-up of a Britain that proved more brittle than its rulers bargained for when they agreed to the referendum eighteen months ago. Andrew RossAndrew Ross is a Professor of Social and Cultural Analysis at NYU, and author of many books, including Bird On Fire: Lessons from the World’s Least Sustainable City and Nice Work if You Can Get It: Life and Labor in Precarious Times.